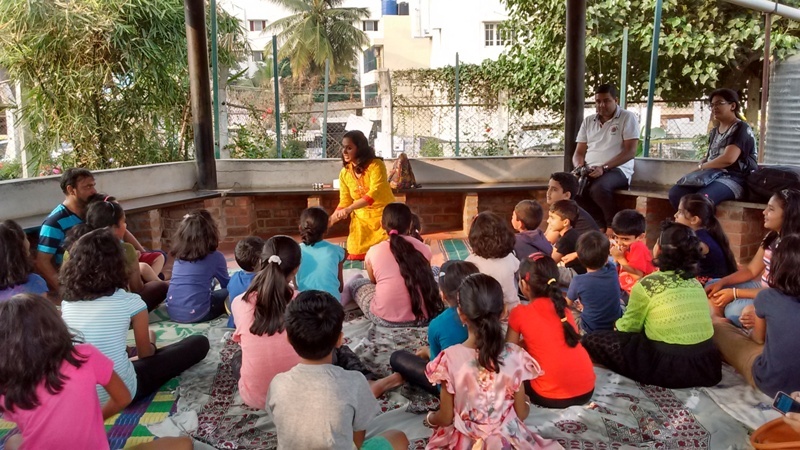 PNLIT celebrated Children's Day on Saturday, 12th November by inviting Ms Lavanya Prasad, professional story teller and founder of TALEscope to reach out to our children through the medium of stories at the lake. 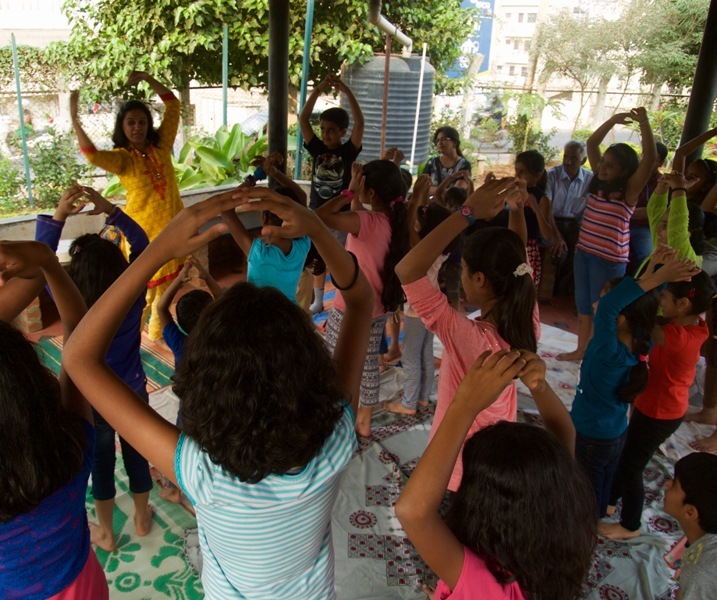 Around 30 children attended this event. A special invitee was Ms Ailbhe Murphy, from Ireland, studying at the Resilience Centre, Stockholm. Here's her report on the story telling. For the last month I have been traveling around Bangalore City visiting lakes that are being maintained and protected by local resident groups. I have come to understand the people in these groups as active "place-makers", who through their dedication and imagination are instilling new meanings into the lakes they care for. Lakes, which not so long ago, were on the brink of disappearing, on the verge of becoming places void of meaning. When PNLIT informed me that they would be hosting a storytelling event at Puttenahalli lake I immediately said I wanted to attend. I saw the event as an example of innovative place-making – a beautiful idea to make the lake known as a place for sharing stories. As Jonathan Gottschall, author of "The storytelling animal: How stories make us human" once said: "The stories we consume shape us profoundly! They shape our attitudes, our beliefs and our behaviours." 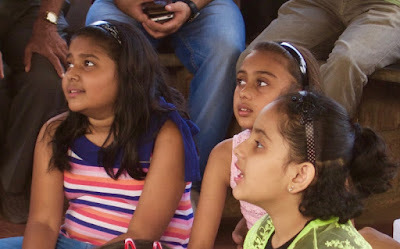 How wonderful then that the 30 odd children, who attended last Saturday's event at the lake, got the opportunity to consume tales about water and the activities and folklore that have sprung from our dependence on it. The first tale we heard was an old village story from Madhya Pradesh. In the story the village was described as a place where everyone could sing beautifully and where songs were inspired by the sounds of water being collected from wells, clothes being washed on the banks of lakes, and cattle bells clanging when cows came to bath. By weaving interactive songs and dances into the narrative the storyteller Lavanya Prasad not only had the kids listening but also ON THEIR FEET and SINGING. 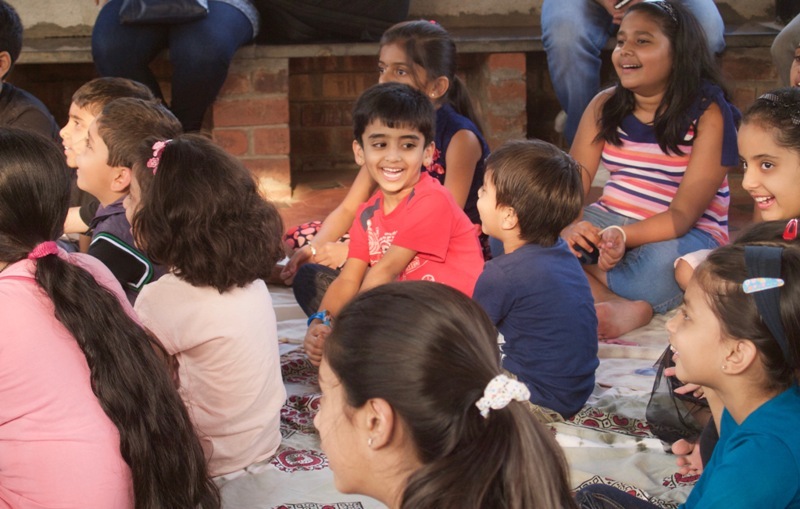 It was gorgeous to see all the children playfully embody the village characters, dancing with imaginary water jugs on their heads and enthusiastically slapping imaginary cloths on the ground. Many adults present couldn't help themselves from clapping and singing along too. For the second story Lavanya transported us to ancient China and told us the myth about a cloud breathing dragon that brought rain to the people. Apparently his cloud breathing powers were thanks to a magic pearl that he kept in his throat! One day, however, the dragon loses the pearl and it is found by a shepherd boy while herding his sheep. When the boy brings the pearl back to his town the precious item brings out the greed of his town's people. To stop everyone from fighting over it the boy decides to swallow the pearl himself. Once it is inside him it works it's magic again, transforming him into a new cloud breathing dragon that swoops off into the sky. As a dragon the shepherd boy continues to bring rain to China, filling its lakes and rivers. 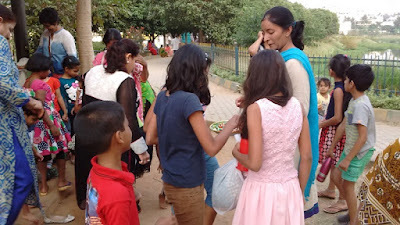 At the end of this story Lavanya brought the group back to their surroundings by concluding that, "Maybe such a myth also exists about Puttenahalli lake!" And, as if he had been listening to the story too and wanted to show the children that just like the dragon he also had impressive flying skills, a pied kingfisher came to hunt for fish as everybody was making their way out from the event. The kingfisher's ability to hover in one spot, before diving into the water caused much excitement. So in the end the kids left with two folktales in their heads and a lake experience from which they could weave a new story of their own. I'm delighted I was able to fill my own head with these rich stories and experiences too and I wish Lavanya, the PNLIT team and the children now growing up around Puttenahalli lake many more happy and inspiring storytelling sessions.